The Pittsburgh Botanic Gardens is a nature reserve in Oakdale, PA- located right next door to Settlers Cabin Park. The park opened in early 2015 on a 460 acre plot of land once used for mining and logging, and currently has about 60 acres that was transformed back into pristine nature and open for visitors to enjoy. This one does require a payment for entry, and those who visit will enjoy a serene hike in nature through several themed zones and unique art pieces. While the grounds of the 460-acre Pittsburgh Botanic Garden are quite large, the fact that roughly only 60 acres are open for visitors makes this one feel cozy. Perhaps it is that the trails span just a couple miles when put together. Or perhaps it is that the various themed areas change at a fairly rapid pace such that you are always experiencing something new wherever you go. In fact, most outdoor botanic gardens and nature reserves we've visited have focused on making their regions feel like wide open spaces. The Pittsburgh Botanic Gardens does the opposite. It is because of this that the Pittsburgh Botanic Gardens is able to offer five distinct regions including the Woodland Gardens, Japanese Garden, and Dogwood Meadow to name a few. One minute you'll be walking past the lotus pond, and next you're deep in the woods next to artwork such as the Bookworm Glen or Hermit Hut, before heading out into an open field next to the bee hives and wild flowers. All in all, a visit to the Pittsburgh Botanic Gardens can be brief as the park is not that large. But with their plans for rapid expansion it will not remain that way for long! In a way, when visiting the Pittsburgh Botanic Garden you get the feeling that contentment is not on the radar of the operators. In fact, they have a grand plan for growth over the coming months and years that will see the size of the property more than double (they have only transformed about 60 of their 460 acres, after all). 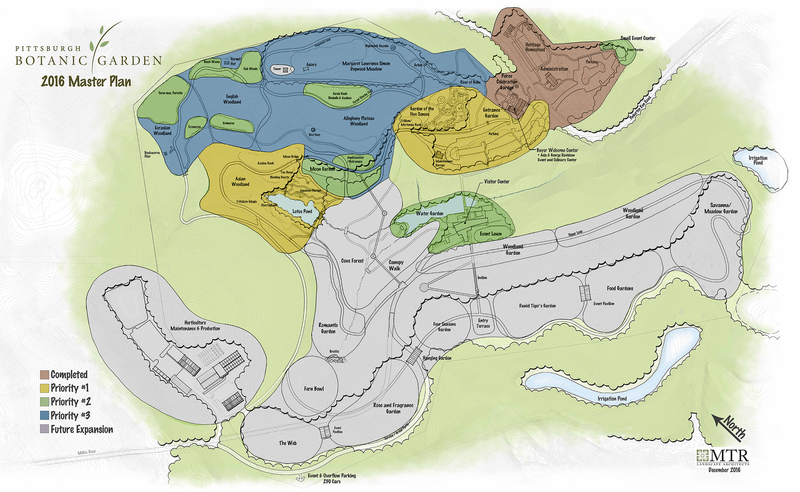 This is highlighted in the 2016 Master Plan (click the previous link for an image), which illustrates some potential additions in the coming years including a Garden of the Five Senses, a Four Seasons Garden, a Rose and Fragrance Garden, a Food Garden, and so much more. It is because of this that you can rest easy knowing that the cost of admission is being put to good use at this local non-profit. Their brightest days are coming soon. The Pittsburgh Botanic Garden is located at 799 Pinkerton Run Road in Oakdale, Pa. Dogs are allowed on leash on the trails. Food and beverages are not permitted and any waste must be taken off-site as there are no trash bins inside the gardens. Photos are ours and hosted with permission by the Pittsburgh Botanic Gardens. For more parks in and around Pittsburgh, check out Schenley Park, Frick Park, Fall Run Park, or North Park! I believe it is $9 right now for adults. Good to know. The website definitely says $9 per person but perhaps they’ve not updated with new pricing. I know the last Groupon special I saw was two for $10.